Existing building shell already in place, the HVAC design had to be re-designed. We installed a heating and air conditioning system by setting new equipment and major ductwork through the building as well as variable air volume (VAV) equipment and numerous fans for air distribution. 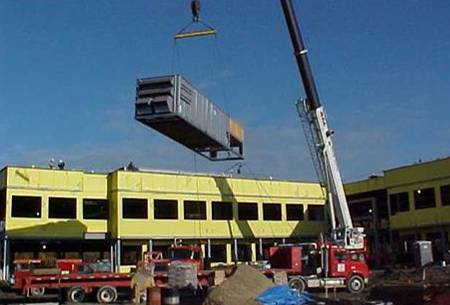 Two (2) giant 75-ton roof mounted DX type units were installed on the roof to provide base building cooling by a crane. The heat system is by fan powered "serial type VAVs" with 2-stage resistance heating units arrayed on the perimeter of the building. The entire building system is managed by a fully automated DDC package. This building thus can be monitored by The Dalad Group at their headquarters.